Students lie on the ground as part of a die-in to protest school closings Wednesday afternoon. WOODLAWN — Witnesses to a Wednesday afternoon protest over city efforts to close schools said at least five students were taken into custody by police. The protest was designed to highlight a situation the protestors say is being created by the proposed closings — that students moved to new schools will be forced to cross dangerous gang lines. Five people were arrested and charged with misdemeanor reckless conduct and obstruction of traffic, but they included four adults and one juvenile, said Officer Michael Sullivan, a police spokesman. Matt Ginsberg-Jaeckle, an organizer with Southside Together Organizing for Power, and others called the event — in which students blocked traffic in the intersection of 61st Street and Cottage Grove Avenue — a "die-in." Students wore mock-bloody clothes in an effort to show the effect they believe school closings will have: more violence and death for the young students forced to cross new gang territories. "The message is that school closings are killing people," Ginsberg-Jaeckle said. "Everyone knows what will happen when these kids start crossing these gang lines." The students laid down in the intersection and blocked traffic for several minutes before being taken away by police after refusing to leave, witnesses said. Despite the arrests, police said Wednesday that the protest was peaceful. According to witnesses at the scene, the people were led away in handcuffs. Kelly High School teacher William Lamme said two of his students were arrested in the protest. "They wanted to do something to show how they feel," said Lamme, a Kelly social studies teacher. 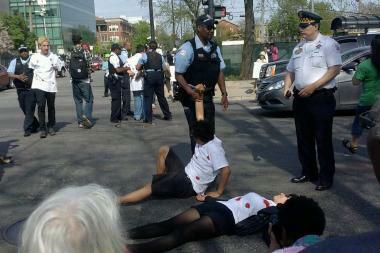 "Mayor [Rahm] Emanuel is certainly creating a school for young activists." Nearly 100 activists, parents and students were at the event, initially arranged by parents from Fiske and Sexton elementary schools. Sexton is slated to close and merge its students into Fiske. "We have to make our voices louder and our actions stronger," said Lamme, who came to support his students. "This is civics 101."